WASHINGTON (CNS) — Imagine turning on the tap in the morning and seeing something that’s “looked like toilet water coming out of your faucet,” in the words of one Catholic leader. That’s been the reality facing tens of thousands of residents of Flint, Michigan, every day for more than a year. Now, imagine looking for safe, potable water and getting arrested for your trouble. That, too, is the reality — and the fear — for immigrants living in Flint without legal permission. Deacon Omar Odette, pastoral administrator of Our Lady of Guadalupe Parish in Flint, said he knows members of his parish who have been arrested for not having immigration documents. “The (federal Department of) Homeland (Security) has come out and said they will not put undercover people in the distribution centers — but that’s only the distribution centers, not the rest of the city,” Deacon Odette told Catholic News Service in a telephone interview. Deacon Odette was part of a delegation from the PICO Neighborhood Network and Michigan Faith in Action that flew March 16 from Flint to Washington by way of Chicago to attend the March 17 House hearing on the ongoing Flint water crisis with Michigan Gov. Rick Snyder and Environmental Protection Agency administrator Gina McCarthy. While in Washington, Deacon Odette and Faith in Action delegates also met with representatives of the Catholic Campaign for Human Development, the U.S. bishops’ domestic anti-poverty arm, to update the situation in Flint, “how distribution is going and what they need still,” Deacon Odette said. “Looking long-term down the road. It’s not going to be the rest of this year (to rid the water system of lead), it’s going to be two, three years. … adapting to whatever people need. They’re really dying to get that across to the people,” he explained. He recounted the story of a 6-year-old Chicago boy who wanted to help and his pastor told him, “Think about it.” The lad thought, and he brought 88 cases of water from the Windy City. “It’s amazing to think a 6-year-old boy could think like that,” Deacon Odette said. 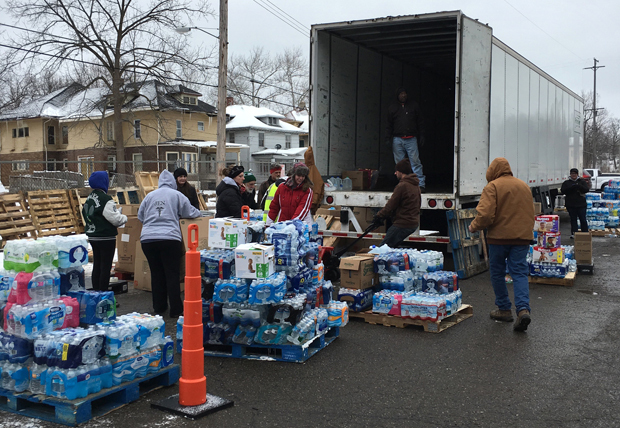 Majority-black parishes in southwestern Michigan brought both U-Hauls full of bottled water “and the people to unload it. Working with our people, it looked like they were here their whole lives,” he remarked. Deacon Odette, who is retired, took on the Our Lady of Guadalupe assignment because the Diocese of Lansing, Michigan, is short on Spanish-speaking priests. While the deacon is not a native Spanish speaker, his wife is. “She takes very seriously what they say about wives being the biggest helpers of deacons,” he said. Two years ago, city managers decided to switch the city of Flint’s water source from Detroit’s supply to the Flint River to save money. The city has been since reconnected to the Detroit water supply but during the time residents were using river water, the corrosive water ate away at old lead-lined service pipes that connect to residents’ homes, ruining pipes and giving them lead-contaminated water.